391 Big Bay Point Rd. 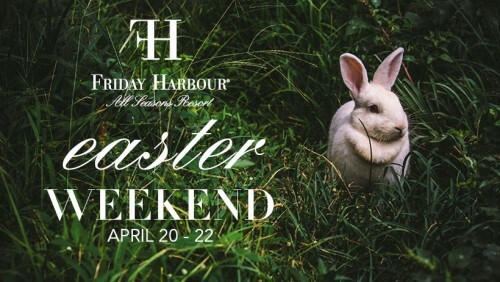 The Easter Bunny is making a special trip to Friday Harbour and we have plenty of activities to celebrate! We will kick things off on Saturday, with our second annual egg drop and an Easter-themed family relay race that is fun for the whole gang! End your day cozied up around the camp fire with live music or trek through the Nature Preserve on our Owl Prowl to scout out some nocturnal wildlife. Sunday will be packed with activities for everyone to enjoy, including a petting zoo with bunnies, hedgehogs and other cuddly critters, an Easter egg hunt, Easter trivia, wagon rides, egg decorating, an Easter scavenger hunt and, most importantly, a special visit from the Easter Bunny himself! On Monday, we will keep the good times rolling with Easter bingo and a special Earth Day craft the whole family can enjoy. The Easter Bunny will be making appearances across the Resort all weekend long so be sure to snap a photo and tag us! PARKING Guests can park in the East Parking lot at the intersection of Sea Ray Avenue and Sunreef Avenue. Shuttles will be on site to drive Guests down to the Boardwalk, Beach Hut, and Harbour Master Building.